On behalf of Asha for Education, I visited a BhimShala at Dodra village, 50 kilometers from Ahmedabad city, in November 2015. Enroute, 2 Navasarjan volunteers stated that a BhimShala is run by a BhimSewak (an adult volunteer) in a villager’s household or in community open space. 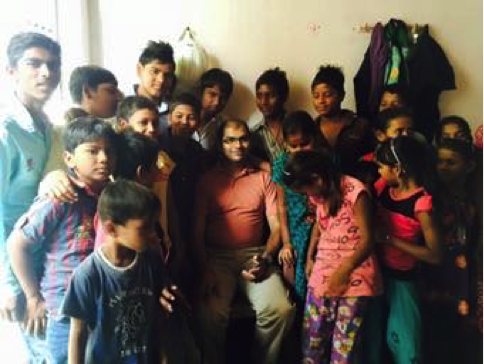 Despite Diwali vacations, the volunteers gathered 20 children (ages 8 through 18) in a town hall type meeting in a villager’s household. The children mentioned that they played various games and conversed school topics at BhimShalas as well as discussed community topics such as sanitation and livelihood. BhimShala is convened 2-3 days during the week and both weekend days, depending on the BhimSewak’s schedule. Instead of me asking the questions to children, I encouraged children to ask the questions. I also met alumni of the BhimShala who go to a college 30 kilometers away or attended Navsarjan’s vocational school. Hearteningly, I noted that the current BhimSewak, an 11th grade student, took up the role, when the prior BhimSewak started going to college. The current BhimSewak also spoke of his dreams of studying in a foreign university or taking up a manager job. The 2 volunteers stated that the BhimSewak inquiries about the quality of education and any discrimination in government schools. Among challenges, they mentioned BhimSewak turnover due to college, job or marriage, as well as BhimShala’s sustainability. BhimShalas benefits abound from provide an after-school forum for children to fostering children’s motivation to continue school and college, and engage parents and community in the children’s education.